The Canary Island controller greeted the crew in the morning with the news that there would be a second maneuver - 5 meters forward - to line the vehicles up properly. The prospects panned out richly, and the crew reported seeing the eclipse "right on the money at 16:01:44 g.e.t." Although the crew thought for a moment that they were slightly off track, their aim had actually been accurate. Note: Partial solar eclipses on January 14, 1964 and July 9, 1964 belong to the previous lunar year set. It is a part of Saros cycle 142, repeating every 18 years, 11 days, containing 72 events. The series started with partial solar eclipse on April 17, 1624. 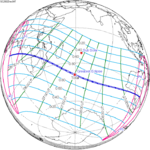 It contains one hybrid eclipse on July 14, 1768, and total eclipses from July 25, 1786 through October 29, 2543. The series ends at member 72 as a partial eclipse on June 5, 2904. 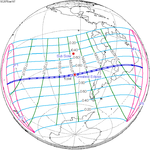 The longest duration of totality will be 6 minutes, 34 seconds on May 28, 2291. This page was last edited on 31 January 2019, at 23:00 (UTC).